As many of you know, Dr. Seuss is a pretty big deal every year around this time, as his Birthday is coming up on March 2nd as is "Read across America" Day! 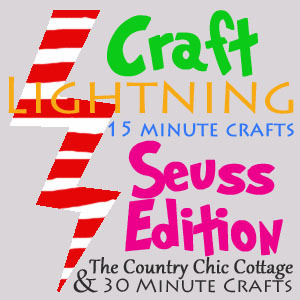 In honor of this, my awesome bloggie friends Angie at The Country Chic Cottage and Carolina at 30 Minute Crafts are hosting a Craft Lightning Series "Seuss Edition". 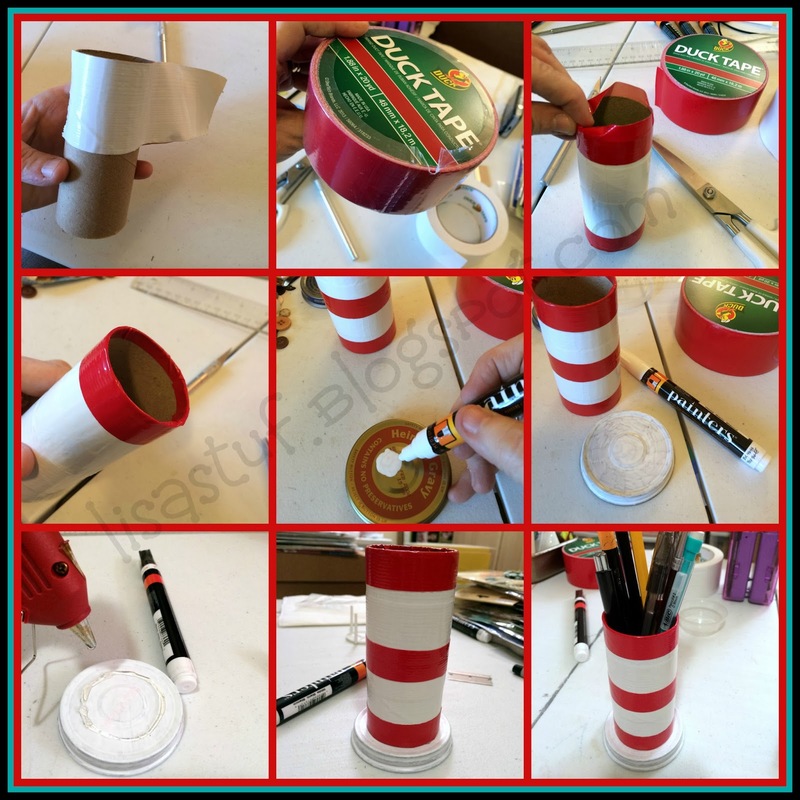 The goal of this series is to come up with a Dr. Seuss craft that takes 15 minutes or less to make (minus drying time). I thought a craft that would be super easy for kids to do and would make use of things you might have around the house would be good for this project. 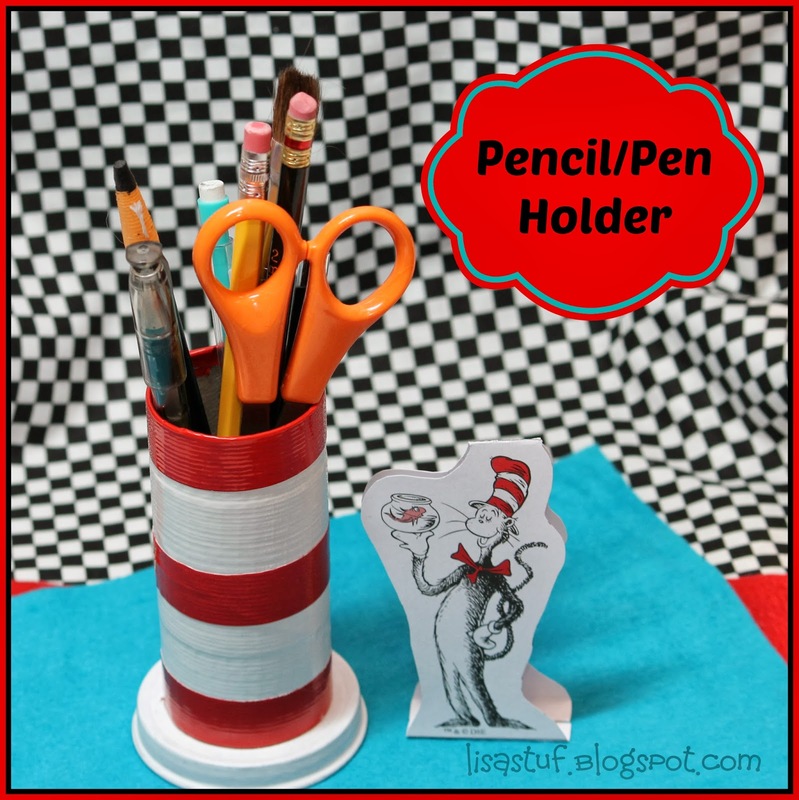 One thing any child young or old could use and easily make, would be a pen/pencil holder for their desk. 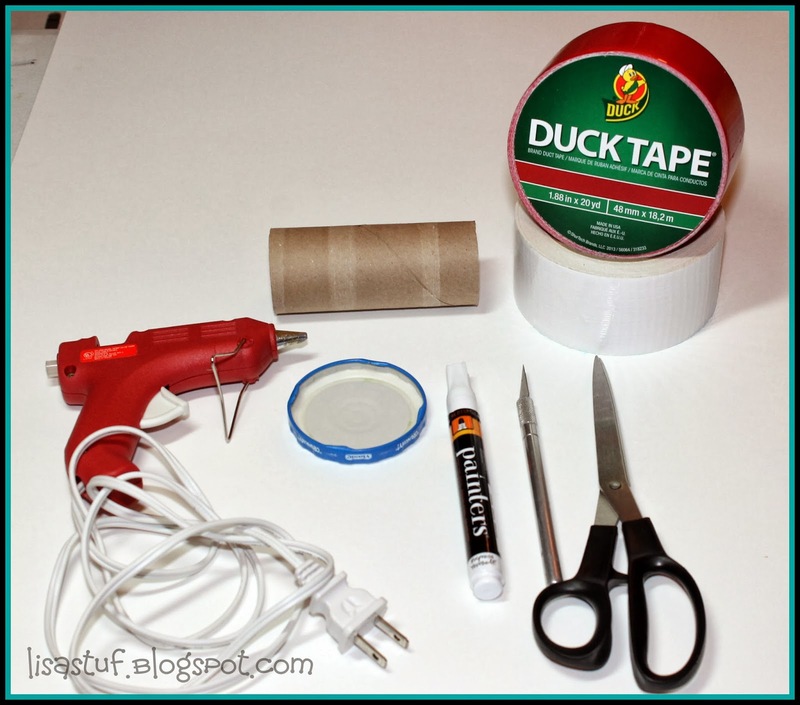 Since I have TONS of empty toilet paper rolls laying around (just ask my husband...he always wants to know WHY??!! ), I immediately thought of using one of those...one less for hubby to fret about! Ha-Ha! I wanted to make it look more like a hat and not just put the striped cylinder with a flush bottom on it. Also, I knew it needed to be a little heavy and somehow be able to remain sturdy to hold the pens and pencils, so I scoured around my kitchen to find some old jar lids and finally found one the right size to make it look like a brim of a hat and to stabilize the holder. I wrapped the paper tube with Duck brand duct tape (white, then red for the stripes). You could measure before doing this, but to be honest, I just eyeballed it and cut the tape with scissors and/or an exacto knife. Next, I painted the metal jar lid with a Elmer's white paint pen. (You might have to do more than one coat, depending on the color of your lid). After the lid was dry I used a glue gun to glue the tube hat onto the lid/brim. 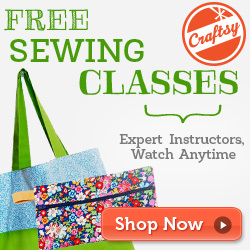 Easy Peasy and a recycle craft to boot! Hope you enjoyed this quick and easy, kid-friendly craft and be sure to check out the other great Seuss inspired crafts by clicking on the Craft Lightning Badge below! 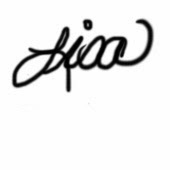 Thank-you for checking out my blog and this project!